A Poverty Row Western about a weird, revenging figure with a rawhide strap across his face, made by filmmakers who seemed to understand the pleasures of pulp fiction without having any idea how to put it on the screen. 1934's "Rawhide Terror" understands the pleasures of the pulp without having the ability to translate those pleasures to the screen. The film suffers from the lackluster directing that plague many Poverty Row Westerns; in fact, it was produced by a company that is largely regarded as one of the worst. 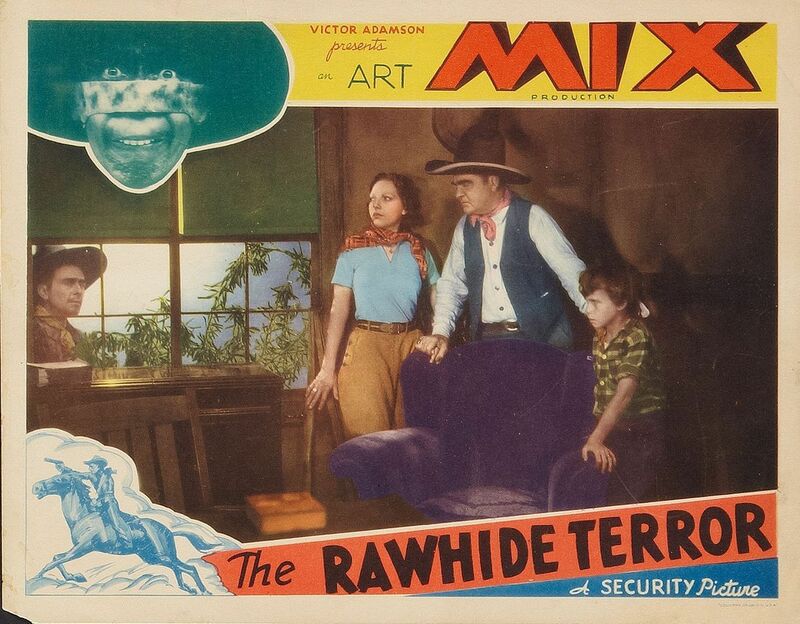 That company was Victor Adamson productions, an independent company started by a New Zealand-born actor-turned-director-turned-producer who, for a while, performed under the name Art Mix, successfully confusing audiences into thinking he must be related to the wildly popular Western movie star Tom Mix. Adamson later hired another actor to play Art Mix, George Washington Kesterson, and then sued the actor over the name when he had some success with it. This movie stars Kesterson as Tom Mix, the men apparently having resolved their differences. The film is flat and barely lensed — most scenes look like someone set up a camera vaguely pointing toward the action and then wandered away. It's a bit hard to follow, because the characters don't have much by way of introduction and aren't especially distinctive, and, worse still, they tend to forget each other's names, so several characters are called by a few names over the course of the film, which they respond to, as though this were unremarkable. Poverty Row Westerns often relied on spectacular, legitimately dangerous stunts, because backlots, horses, and wanna-be-actors who were willing to throw themselves around (often having their own costumes!) were all cheap, but "Rawhide Terror" doesn't feature the sort of reckless, devil-may-care stunts other films offered. There is, in truth, little to recommend it, but for an enjoyable opening scene in which bandits dressed as Indians murder the parents of two little boys. One of the boys goes spontaneously mad and wanders off-screen, giggling. The rest of the film takes place 10 years later, when the desperadoes have taken over a small town, some of them passing themselves off as bankers. One of the boys, the sane one, played by Mix, also lives in the town, apparently oblivious to the fact that, but for a sidekick, an abused boy, and a romantic interest, every other resident of the town is a villain who killed his parents. Somebody remembers, though, and this is where the pulp pleasures are hinted at, if never successfully translated to the screen. That someone is called the Rawhide Terror, in part because he is murdering every one of the villains and then leaving little rawhide notes warning that he will keep killing. But he also has the name because his only disguise is a rawhide strap he wraps around his face, over the bridge of his nose. This sounds like the laziest costume ever, and probably is, but it also works. There is something genuinely uncanny about this killer, with his leather vest and sombrero-like black hat and leather chaps; he looks like he's wearing a costume from some bizarre folk celebration that likely involves self-mutilation. When we first meet him, he's torturing a Gila monsters, and he has the habit of erasing his tracks after a killing, so, to the townsfolk, he presents himself as a psychopathic ghost. The Rawhide Terror engages in the behavior of pulp villains, such as staking people to the ground and then laying traps for their rescuers, and everybody in town agrees he's a problem and must be taken care off, especially since almost everybody in the town is his target for having killed his parents. He seems to get a little impatient halfway through the film, swapping out sadistically murdering individuals to just wiping everyone out with TNT. Spoiler: He's killed in the process, but not before reuniting with his brother; they recognize each other because they have the same distinctive mole in the same distinctive place. In competent hand, this could have been a lot of fun. The Terror's phantom-like qualities could have been heightened so that we, the audience, are not sure if he is a living human or a spirit set on revenge. 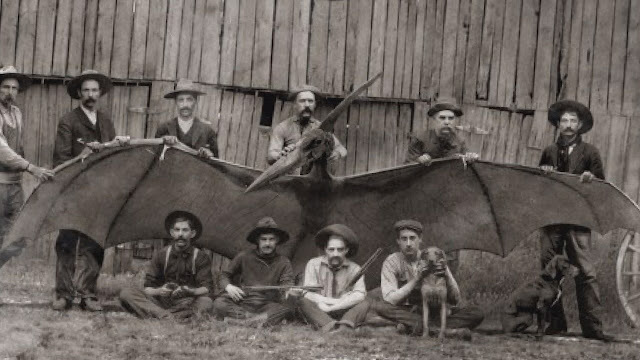 The reason for the Terror to target and murder the bandits could have been a mystery, uncovered over the course of the film. The movie could have been filmed in such a way that it heightened the film's sense of supernatural menace. Actors could have remembered the names of the other characters. Alas, none of that happened. There's little to say to the resulting film's credit, except that they apparently realized that if they cannot be good, they should instead be short. The film is about 50 minutes long.